When it comes to your child’s precious smile, a customized mouthguard can provide valuable protection in multiple situations. Bruxism (more commonly known as teeth grinding) is a common affliction among young patients, although most will outgrow it eventually. As bruxism can cause headaches and dental damage, Dr. Danielle may recommend the nightly use of a mouthguard to cushion the teeth and prevent aggravating contact. Is your child an athlete? If they’re regularly participating in a sport where physical contact with hard surfaces, projectiles, or other players is a possibility, their teeth could be in danger. 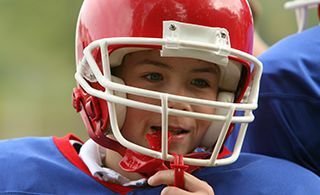 Instead of grabbing a “one-size-fits-all” appliance off the shelf at an athletics store, let our team provide your son or daughter with a sportsguard that’s modeled for their unique smile and provides them with the sturdy, comfortable support they need. At Pediatric Dentistry of Prospect, we love helping kids of all ages smile brightly and confidently through the years! Contact us today to schedule a first visit, or if you have any questions. Our team is happy to serve Green Spring, KY and other surrounding areas as well.